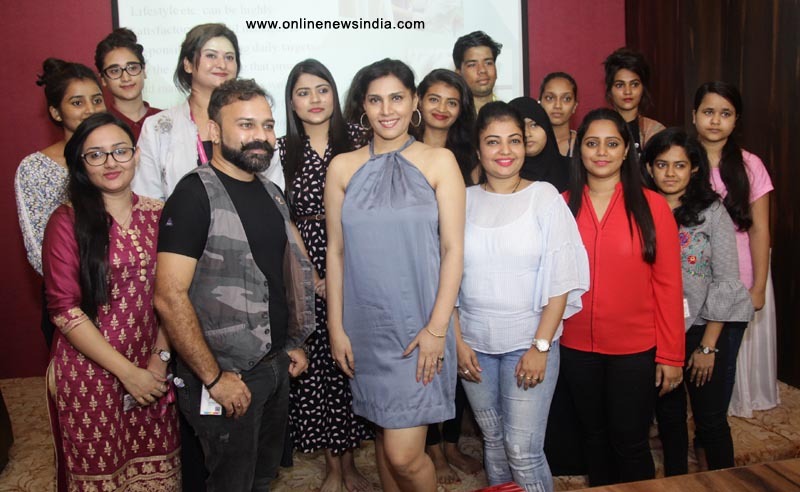 Mumbai, June 10, 2018 (Team Online News India): Nilaanjana Bhattacharya inaugurated the fashion and art workshop of Atharva group. She also talked with the students of the institute. Professor Jiten Giri (Head Faculty) also accompanied at the event. Nilaanjana Bhattacharya was seen recently seen on the blockbuster hit Judwaa2. Not only in films, she also performed in stage shows. She has performed in many Indian dance festivals nationwide and in international shows and has won numerous accolades. Atharva Group always comes up with such ideas and workshop which creates enthusiasm in the youth. At ASFA they had implemented various techniques and adopted unique strategies that are unparalleled by any other institution to fulfill their aim ''To excel beyond expectation”. They believe in the complete development of students. Along with comprehensive academic training, a serene and conducive environment is provided through our huge designing area, Hi-tech sewing lab, Seminar hall, a chic cafeteria, well equipped Computer Lab and last but not the least our In-house Library. ASFA is in association with Secoli (Italy) and MDIS (Management Development Institute of Singapore). Fashion design is the art of applying design, aesthetics and natural beauty to clothing and its accessories. It is influenced by cultural and social attitudes and has varied over time and place. The main emphasis is hands-on practicals which are very important in every phase of the fashion industry or garment creation. Time to time market surveys, industrial visits, and fashion shows give students a wholesome idea of the fashion industry and its flow. The in-house clothing and accessories brand of Atharva is Tangerine. The Tangerine brand is also worn by the contestants of the popular beauty pageant, The Indian Princess. We at Atharva give a widened scope to our students to grow in haute couture fashion across the globe.